OK - that's it - we've woken up to another blanket of snow here in southern England; the roads are hushed, the schools are closed; there'll be more stories about how we're not equipped to cope in this country. So as I look out of my window onto another Brighton "white-out" I'm going to reflect of one of the glorious gardens I visited last summer, to lift my spirits. Welcome to Waterperry near Oxford - eight acres of ornamental gardens, founded by a Miss Beatrix Havergal in the 1930's - to educate women in horticulture - and now a glorious palette of colour to remember as I look out over more white streets and try to remember just what is planted in my garden under the latest blanket of snow. Open all year round (except Christmas), you can look forward to special snowdrop weekends here next month on 6/7 and 13/14 February. This is a wonderful garden, home to the National Collection of saxifrages (kabschia), with more than 300 species and cultivars, but most memorable for its incredible herbaceous stock beds and borders (top) - an absolute joy in terms of their density of planting, fine colour schemes, and impeccable labelling (which means that even I can't make excuses for my inability to remember plant names, because here at Waterperry, I could just take photographs of plants and labels to jog my memory!). The formal garden is one of the garden's best-known features, with its swirling knot garden and tunnel of white wisteria, plus the "The Lamp of Wisdom" sculpture (above). 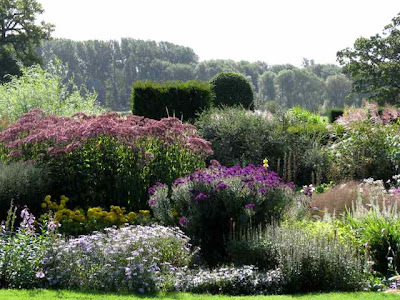 Alpines, dwarf conifers, a rose garden, water-lily canal and five acres of commercial orchard producing apple juice are also well-known features of this stunning garden, plus an excellent nursery, where you'll be hard-pressed to resist buying for your own garden. 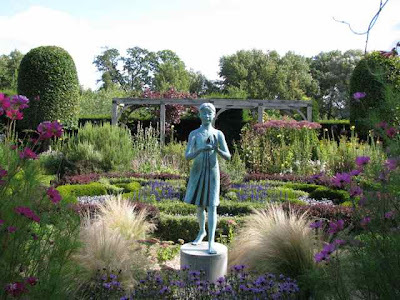 It's well worth checking what's on at Waterperry because there is a full programme of gardening and arts and crafts on offer. 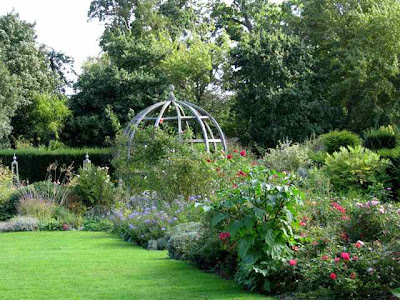 And, if you want to combine this beautiful garden with others in the area, you can put Rousham House and the University of Oxford Botanic Garden on your list. Beautiful memories to fall back on.... I have a few frds in London and they have tell me all abt the snow...and here I have never ever since snow at close quarters *sigh* :) Its lovely I can virtually visit the England Gardens n more via your blog. That certainly lifted my spirits, Charlotte, thanks. This seems a perfect place to visit, something for everyone. Oh dear, yet more snow! It's a never ending nightmare isn't it?!!! Instead we have ice, white ice and where it's cleared it's black ice. I'm iced in, ended up doing a belly flop down our street, gave up and came home. I'm not too confident I'll even make it in tomorrow either. 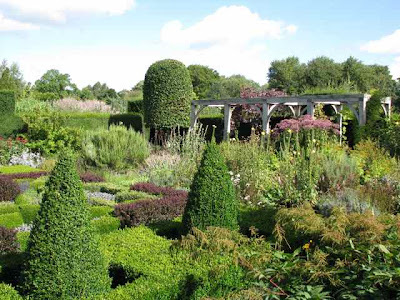 Waterperry, I know it well. Used to exhibit there for Art-in-Action. Lovely setting. Getting pretty fed up with the white stuff. We managed to get through yesterday, when there was a 'window of opportunity' to replenish the larder. One of my favorite gardens as well. So sorry you are feeling housebound. Take lots of pictures and next summer, during the heat wave, you can cool off a bit. This is a nice variety of shots of some beautiful plants and sculpture. Thanks so much for such beautiful pics! I could really use some summer right now. It's so cold where I am. If it's any consolation, Charlotte, your winter hardships (unusual as they may be) will soon be over. I, on the other hand, am nowhere near the end. Thank you for another blissful tour of a wonderful garden ! Those gardens are gorgeous. I especially love all of those purple accents. Ah, well, our part of the country is paralyzed by snow. It's not economically feasible to keep stocked up for snow that may not come. Those are nice gardens. When does it start to warm up for you in Southern England? Lovely photos of a lovely garden. At last it has started to thaw. Beautiful - a real shot in the arm after all the bad weather we've had. Thanks for sharing. I love the stipa grasses in that last photo. Beautiful photos as usual Charlotte.